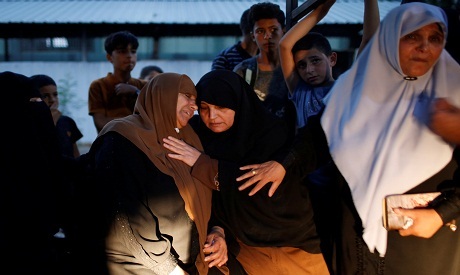 A Palestinian teenager was killed on Wednesday when a tear gas canister fired by Israeli occupation troops during a border protest hit him in the head, Gaza health officials said. A Gaza health ministry spokesman said the incident had occurred close to the border fence in the northern Gaza Strip and that 24 people had been wounded. Israeli occupation troops used anti-riot means, including tear gas and rubber bullets, and, when necessary, live fire, he said. At least 193 Palestinians have been killed since protests began in Gaza on March 30 to demand the easing of an Israeli economic blockade and the right of return to lands that Palestinian families fled or were driven from on Israel's founding in 1948. More than two million people are packed into Gaza, whose economic plight is a focus of so-far fruitless U.S.-led efforts to restart Israeli-Palestinian peace talks, stalled since 2014.